SwimLabs is excited to announce that 4x Olympic Medalist, Kaitlin Sandeno, will be hosting a Clinic and Private Lessons on March 3rd! Kaitlin Sandeno, is a 4X Olympic Medalist, world champion, and former world record holder. She also is now the national spokesperson of the Jessie Rees Foundation, a motivational speaker, coach, sports commentator, emcee, and host for world-class sporting events.Kaitlin will be hosting her clinic with Laguna Fin Co. We couldn't be more excited for her to come visit our location, use the new fins, and work with our swimmers! • A pair of Laguna Swim Co. Fins for each swimmer with a demo. • Pool work on under-waters and turns. Private Lessons for any stroke with Kaitlin will be offered before the clinic from 12:00pm-3:00pm. Only 6 30-minute openings! Click HERE to book your Private Lesson with Kaitlin! SwimLabs is excited to announce that 3-Time Olympian, Elizabeth Beisel, will be hosting a SwimLabs Champions Starts and Turns Clinic and Private Lessons on April 22nd! Elizabeth Beisel, an IM and backstroke specialist, competed in the 2008, 2012, and 2018 Olympic Games, where she earned the title of team captain. She has won a total of 9 medals in international events: 4 gold, 1 silver, and 4 bronze. Recently, she has been a key team member of the LEAD Sport Summit Camp. We couldn't be more excited for her to come visit our location and work with our swimmers! - Work on your starts and turns with Elizabeth and our SwimLabs staff in an outdoor pool! Private Lessons for any stroke with Elizabeth will be offered before the clinic from 9:00am-12:00pm. Only 6 30-minute openings! Click HERE to book your Private Lesson with Elizabeth! Select "Competitive Elite" for the lesson type, then "Elizabeth" as the instructor. Want to get a great workout in AND bring the kids in for a swim class?! We are excited to announce our first Open House with FIT4MOM at SwimLabs. SwimLabs trial group lessons will be run throughout both workout options! All ages are welcome. Here's the best part... it's all FREE! Olympic Gold Medalist, David Walters will be hosting a 2-hour small group clinic on under-waters, breakouts, and finishes. In this clinic David will guide swimmers through his favorite drills and make corrections with each swimmer. Swimmers will be sent home with their video analysis as well as an informational presentation packet. Coach Megan and Coach JC will also be coaching at this clinic! 30 minutes of David speaking about his swimming experiences, importance of under waters, and techniques he has used to improve his under waters. 30 minutes of David speaking about the importance of breakouts and finishes, as well as multiple drills and techniques he has used to win his races! 1.5 hours of pool work in the tanks: David will guide swimmers through his favorite drills and make corrections with each swimmer with the support of SwimLabs staff members. Swimmers will be divided up into groups of 4 in the tanks. Photo opportunity with David and his GOLD MEDAL. Olympic Gold Medalist, David Walters will be hosting a 2-hour small group clinic on under-waters. In this clinic David will guide swimmers through his favorite drills and make corrections with each swimmer. Swimmers will be sent home with their video analysis as well as an informational presentation packet. 1 hour of David speaking about his swimming experiences, importance of under waters, and techniques he has used to improve his under waters. 1 hour of pool work in the tanks: David will guide swimmers through his favorite drills and make corrections with each swimmer with the support of SwimLabs staff members. Swimmers will be divided up into groups of 4 in the tanks. WHAT: Coach Bryanna will be running a 2-hour clinic that includes shoulder thera-band exercises, stretches and techniques that help swimmers prevent season changing injuries as well as strengthen particular muscles in reference to swimming. Coach Bryanna has her Bachelors degree in Health Science and Injury prevention, and is also certified personal trainer for all different types of athletes. Enrollment pricing includes your own thera-band as well as an informational packet sent home with the swimmer. 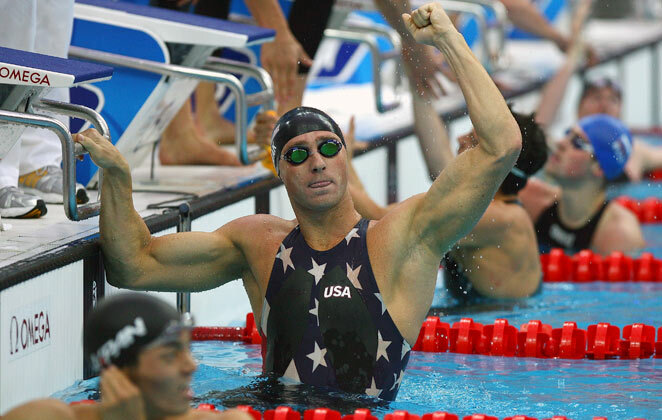 Join SwimLabs on Saturday, September 9th for a special clinic with Olympian Jason Lezak!